Part 2: From the events at Fort Seybert to the defeat of the NW Indian Confederation. Wednesday, 28 April 1758: On this fateful morning, a fog lay upon the land shrouding South Fork Valley. The immediate presence of the approaching Shawnee war party was unsuspected. Eastward from the stockade, the ground fell rapidly to the level of the river bottom. At the foot of the slope was a damp swale through which flowed a stream that was crossed by a log bridge. A few yards beyond this was a spring which supplied water for the fort. In the early morning hours a woman walked there for water and was unaware that an Indian, supposedly Killbuck himself, was hiding under the log bridge. About this time, Sarah Dyer-Hawes, the wife of Peter Hawes (deceased), went out with a servant boy named Wallace to milk some cows. While following a path which today leads toward the circa 1910 Post Office (south of the fort), they were surprised by two Indians and captured. Mrs. Hawes was said to have had a pair of sheep shears in her hand and to have attempted to stab one of the Indians. William Dyer had gone out to hunt earlier that morning and was waylaid by the Indians near the fort. He had time to fire his weapon, but his flintlock refused to prime. As he drew back the hammer for a second trial he was pierced by several musket balls fired by the Indians. William fell dead and the cocked flintlock dropped from his grasp, where it lay on the forest floor until decay of the stock separated lock and barrel. Mr. J. Clem Miller, (son of William C. Miller), has in his possession a rusty flintlock with its hammer cocked that was found west of the fort. He believes it may have been in the hands of William Dyer when he was killed. The gunfire alerted the fog shrouded settlement. With the presence of the enemy now known, Nicholas, the 15 year old son of Captain Jacob Seybert, took station in the upper floor of the blockhouse. From his elevated position, he mortally wounded an Indian, who raised his head from behind the ledge of rocks under the brow of a hill, one hundred yards eastward, in the direction of the spring. At this time a horseman was riding toward the fort, but hearing the gunfire and knowing something was wrong, he spread the alarm among the more distant settlers. Presently, Chief Killbuck, who was leading the war party, walked into a clearing by the fort and called for a truce. He called on the defenders to surrender the fort, threatening no mercy if they did not, but good treatment if they did. Killbuck had good reason for using deceit in an attempt to take the fort. It was not a great distance from Fort Seybert to the more heavily populated regions of the Shenandoah Valley. White reinforcements would certainly be coming, so time was an important element. Jacob listened to the deceitful parley. Although there were about forty persons in the fort, there were very few men amongst them. Most of the men from Dyer Settlement had gone across the Shenandoah Mountain on business a day or so before, among them Matthew Patton, Michael Mallow and Andrew Trumbo. Also, several families had fled the valley in fear that very morning. Regardless, it is doubtful that Fort Seybert ever had a strong garrison. Whether the fewness of adult men or a shortage of supplies, especially ammunition, had anything to do with Jacob’s decision is not known, but Jacob yielded to the demands of the enemy, which also included turning over what money and other valuables the defenders had. Just before the gate was opened, Nicholas Seybert took aim at Killbuck and was squeezing the trigger when the gun muzzle was knocked downward; the ball only raised the dust at Killbuck’s feet. surrender had been decided upon, Nicholas was so enraged he attempted to use violence on his father, Jacob. The gate was opened, and the savages rushed in. Killbuck dealt Jacob a blow in the mouth with the pipe side of his tomahawk, knocking out several of his teeth. Instantly the whites realized the horror of their situation and saw the inevitable doom which awaited them. In a false moment of security, they had trusted the promise of savages and now were about to pay for the folly with their lives. Nicholas did not surrender, but was taken prisoner by being overpowered. When the settlers were secured and led outside, the fort was burned. A woman named, Hannah Hinkle, bedfast at the time, perished in the flames. The man, Robertson, had hid himself and as soon as the Indians withdrew, he hurried to the river, followed a bluff to conceal his tracks and made his way over the Shenandoah Mountain. According to Keister family tradition: When the Indians poured into the fort and the settlers found they were to be massacred, they broke and ran. During the confusion, Hannah Dyer Keister hid with two small children and one infant among large rocks about 200 yards from the fort and remained there during the slaughter. The boulders being huge, could hide several people amongst them easily. Today the place where she hid is called Galloping Run. The war party took their prisoners up the slope toward South Fork Mountain, where they stopped on a hillside about a quarter mile to the west of the burning fort. After some discussion, the Indians separated their captives into two groups and seated them in rows on two logs. The row on one log was for captivity; the other was for slaughter. Those to be killed were tied hand and foot. On a signal, the doomed persons were tomahawked and scalped. Their bleeding bodies left where they fell. Sarah Dyer-Hawes fainted when she saw her father sink below the blow of his executioner. Tomahawks continued to fall killing the already wounded Jacob Seybert, age 41 years; his wife Mary Elizabeth Theiss, age 37 ; Jacob’s mother Johanna (about 65 years old); and others. Suddenly, James Dyer, a tall 14 year old boy, broke away and ran ahead of several pursuing warriors to a thicket on the river a half mile to the east. He was recaptured. Of the thirty settlers captured within the fort, only eleven were spared. Among the remaining captives were the children of Jacob and Mary Seybert: Nicholas, age 15 years; ancestor Margaret, age 12; Catherine, 10; Elizabeth, 9; Henry, 7; and George, 5. The other surviving captives included James Dyer, Mrs. Sarah Dyer Hawes, Mrs. Jacob Peterson, pregnant Mrs. Mallow, and Miss Henever. The Indians’ reason to spare the captives was to adopt them and, thereby, strengthen the tribe. They wanted young men who would make valiant warriors and strong young women who could help the squaws do work. They did not want old people, weaklings or cowards. They preferred brunettes to blondes because they more closely resembled the Indian complexion. The Wallace boy’s blonde scalp was later seen by Sarah Hawes at the Indian village. By now, it was pas t noon. The war party, with their eleven remaining captives and their wounded comrade on a improvised litter, began climbing South Fork Mountain. (Their route can be followed on the Pendleton County Map.) The settler’s surrendered valuables, which included a half bushel of silver and gold coins, had been collected in an iron kettle that carried on a pole between two braves. As the trudging up the east slope of the South Fork Mountain became more burdensome and fear of pursuit made faster travel more advisable, the two Indians fell behind the group and hid the valuables. It is doubtful that they returned to claim the treasure, as this was their last known visit to the area. One of the women, Mrs. Mallow, had a crying baby. To quiet it, an Indian seized the child and stuck its neck into the forks of a dogwood sapling and let the tree fly back. The baby died. The war party followed a pathway, still known as Indian Trail, which crosses South Fork Mountain through Dean’s Gap and the Deer Run area. By nightfall they had reached Greenawalt Gap, having come about nine miles north of the smoldering Fort Seybert. It was here that the Indian, which Nicholas Seybert had shot in the head, died of his wound. He was buried 500 feet up the steep mountain side in a cavern. Until 1850 or so, portions of the skeleton were still to be seen in the cave. The next morning the group continued past the site of the burned Fort Upper Tract and through Germany Valley. Their second night’s encampment was at the mouth of Seneca River. The party traveled without pursuit or mishap. 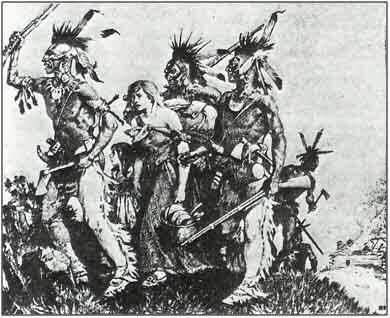 After a journey of nine days the band of Shawnee and their captives reached the Indian villages near Chillicothe, Ohio. The next day after the massacre at Fort Seybert, a relief party led by Captain Brock, undoubtedly notified by Robertson, arrived at the smoldering ruins. It was too late to do anything, except bury the slaughtered victims. Their ghastly corpses were interred in one common grave, undoubtedly, very near the spot where the tragedy occurred. A stone wall was erected around the grave, where it stood for nearly a century. The wall was removed by a Road Overseer, who was willing to overlook common decency and respect for the resting place of the dead, inorder to fill a mud hole. George Washington estimated the total loss of life at Fort Upper Tract and Fort Seybert at sixty persons. The burning of the forts and general havoc wrought in the foray delivered a severe blow to the infant settlements, but the land was not abandoned. The captive pioneer children lived in a Shawnee Indian village near Chillicothe, Ohio. Several years after his return, Nicholas Seybert sold his father’s farm to John Blizzard and made a new home on Straight Creek. Some of his descendants still live in that vicinity. From 1768 to the early years of the Revolutionary War, he owned a Tavern or Inn at Fredericktown, Maryland. James Dyer remained among the Indians for about two years, occasionally accompanying trading parties to Fort Pitt, now Pittsburgh, Ohio. On his last trip, he was sent with an Indian to buy bread. Eluding his companion, he entered a cabin and sought protection. A French trader’s wife hid him behind a trunk and stacked furs over him. In searching for James, the Indians came into the hut and removed a few furs, but stopped before he was discovered. About a year and a half after making his escape, James accompanied his brother-in-law, Matthew Patton, to Fort Pitt to sell cattle. A cattle dealer told them that a tribe near there had a red headed woman among them. Matthew arranged for a store dealer to have the woman come to the store. The woman was his sister, Sarah Dyer Hawes. She was hidden behind and under the store’s counter and covered with hides. Sarah’s captivity made some changes in her appearance and manner, so that when she returned, her young daughter did not recognize her. In time the child accepted her identity. Sarah’s husband, Henry, had died in 1755, before the massacre. In 1764, a couple years after escaping from the Indians, she was remarried to a Robert Davis. Sarah died circa 1818, at about 80 years of age, leaving behind at least 25 grandchildren. The pregnant Mrs. Mallow gave birth to a son, Henry, in captivity. She eventually returned to her husband Michael, just before he was to be remarried. As cruel and unmerciful as the Shawnee were in war, when a captive was saved and adopted into an Indian family the captive was treated the same as any other member of that family. Every effort was made to make adopted whites content and create in them a willingness to stay. Returned captives stated that they were treated with great hospitality and kindness, according to the Indian’s ideas of these virtues. When the colonial militias and later the United States army forced the surrender of white captives, there was often great sorrow at the parting. The Indians delivered their beloved captives with utmost reluctance, and shed torrents of tears over them. As long as the army remained in camp, the Indian families would visit their adoptee daily, bringing them corn, skins, horses and other materials they had bestowed on them while in their families. This first stage of the Pioneer Period was brief. It marks little more than the gaining of a foothold on the new soil. It was the story of a weak settlement in the remote corner of a huge country. With the collapse of French power in America in 1760, the Indian peril became less acute; however, the Indians carried on a war of their own account. Meanwhile, a renewed wave of immigration swept into Highland County, into that part which became Pendleton County, West Virginia. Land values rose, and highways were extended. Church and school houses made their appearance. In 1764 the Indians were forced to give up some thirty two men and fifty eight women and children as captives. During 1770, about 10 years after her escape from the Indians, 25 year old Margaret Seybert married 24 year old William Janes IV. William and Margaret developed a plantation on Straight Creek about 25 miles southwest of old Fort Seybert and the Dyer Settlement. Their property was possibly either adjoining a part of or very near William’s parents’ plantation, which had been purchased in 1751. The William Janes IV and Margaret Seybert plantation (ca 1770-1801) included properties located between 3 to 4 miles north of Monterey, on both the north side and within the forks of Straight Creek and West Straight Creek. In this location the plantation was about 2.5 miles south of the confluence of Straight Creek and the South Branch of the Potomac. Nicholas Seybert and his brothers also bought property and lived in this area. jewsharps. The Indian Tribes were being pushed west and northwest by colonial expansion. Meanwhile on Straight Creek, William and Margaret started a family with the births of son, Henry, born 1771 and daughter, Eleanor, born 1773. 1) There was a successful revolution against England. 2) The French, who had been our enemies during the French and Indian War, were now celebrated allies in our fight for freedom. 3) A fledgling, post Revolutionary War colonial government formed and signed the Constitution of the United States. During 1774: Beyond the Shenandoah Mountains, a ten year period of peace with the Indians came to an end. In a band stretching from the Indian Territories of Ohio into ‘west’ Virginia, there developed a long period of hostilities. Beginning in 1774 and lasting twenty years, a renewed state of guerrilla warfare existed between the settlers and Indians. During this long period there was always the chance that some war party might pass through the broadening zone of settlement and once more bring the tomahawk and torch to the realization of people who knew from experience what these things meant. At their plantation on Straight Creek, a tributary of the South Branch of the Potomac, the William Janes IV and Margaret Seybert family continued to grow with the births of John, born in 1777, Samuel in 1779, my ancestor ♥ William V in 1780, Edward in 1783, Elizabeth in 1785, and Margaret in 1787. In 1789, George Washington, who in his younger years directed that Fort Upper Tract and other frontier forts be built on the western Virginia frontier during the French and Indian Wars, and who went on to command the Colonial Militia during the American Revolution, was overwhelmingly elected first President of the American Republic. Records for 1793 show 47 years old William Janes was a company officer with the rank of Captain and commanded 67+ men in the First Battalion of the 46th Regiment. One can imagine the 48 year old Margaret Seybert backing her husband’s periodic duties as Captain of the local militia over the years. Most of her life was spent in a tense and hostile relationship with the Savages. About 35 years earlier the Indians killed her mother and father, grandmother, step-grandpa, and others she knew and loved and took her and her siblings into captivity. Then, for the last 19 years there existed a state of guerrilla warfare between the Indians and settlers. 1794: During the second term of his Presidency, George Washington appointed Revolutionary War hero, General Anthony Wayne, to command the U.S. Army against the Northwest Indian Confederation. On 20 August 1794, General Wayne, with a force of one thousand seasoned soldiers, met and routed two thousand warriors who had gathered for the final confrontation near Fort Miami on the Maumee River in the Ohio Territory. The decisive defeat of the Indians at The Battle of Fallen Timbers, lead to the Treaty of Greenville in 1795. By terms of the treaty, the Indians were forced to cede to the United States most of Ohio and a large area which later became Indiana, Illinois and Michigan. During September 1832, as per the treaty, the Shawnee were removed from Ohio and sent across the Mississippi River to Indian Territory on the Kansas River. The next time our family line encountered the Shawnee was by Pulaski Easton: during the California Gold Rush of ’49 (see associated article). By this time, they were a peaceful, impoverished tribe, living on the Great Plains in ‘Indian Territory’, west of Independence, Missouri. “Grave site of the 17 victims of the Fort Seybert Massacre, April 28, 1758. The ground, on which Fort Seybert stood and upon which now stands a mortar and stone wall surrounding the grave of those slaughtered at Fort Seybert, belonged to Jacob Seybert. In 1768, Nicholas Seybert, son of Jacob, sold the 210 acre tract to John Blizzard. One of John Blizzard’s heirs sold the land to a minister named, Ferdinand Lair, in about 1800. Ferdinand Lair willed the land to his grandson, John Miller. The land was willed down the Miller family to William C. Miller (alive in 1916) and his sons, J. Clem Miller (alive in 1936) and Ed T. Miller. In the late 1980s the property belonged to elderly Paul Conrad, a widower, who married a Miller daughter. In later years, a willow cutting was planted near the spring which grew into a tree measuring four and a half feet in diameter. It is thought that the tree subsequently dried up the spring. William was the eldest son of Roger Dyer. William had a wife and two sons. His brother, James Dyer, and sister, Sarah Dyer-Hawes, survived the attack as captives. The ledge where the Indian was shot is, in the 20th Century, in front of the main entrance of the William C. Miller house, at a distance of about 100 yards. Pendleton County Historical Grave Register, (Pendleton County: West Virginia, 1977), 52. Morton, History of Highland County, equivalent to $180.71 in 1910. Correspondence with Doris Grubb Hughes. While looking for literature regarding Seybert descendants at the Monterey, Virginia, public library, Doris and John Hughes were approached by the Head Librarian who while speaking with them claimed to be a descendant of Nicholas Seybert. She said that Nicholas had owned 3000 acres in the vicinity of Monterey. It is estimated there were approximately 2,000 incidents of kidnapping of white settlers during the French and Indian War. A twill weaved fabric made of silk or wool and often used for military uniforms. Article, Pulaski Easton – California ’49er, mentions the Shawnee briefly, Line C: Midwestern Migration. Deed recorded in Pendleton County, West Virginia. With the Peace of Westphalia in 1648, most of the hostilities in Europe’s Thirty Year War ceased. The German emperor became a figurehead and the country collapsed into about three hundred regional entities, each with full sovereignty. The territorial princes and rulers became free to build their own military powers and finances without interference from above or below, thereby consolidating the basis for their increased independence and for absolute government within their own territories. In these times, during the year 1717, Jacob Seibert was born to the family of Christopher and Johanna Seibert in the small town of Sotern, Saarland, Germany. Jacob was the fourth and last child in the family which included two brothers, Adam and Wendel, and a sister, Catherine. On 28 July 1732, at fifty years of age, Christopher Seibert died in Sotern, thus disrupting the family’s well being at a time of deep rooted, national economic problems. Saarland, like other parts of southern Germany, had suffered untold hardships during the Thirty Year War and during the 17th Century struggles for empire between France and Austria. German emigration rates were rising as a result of Europe’s unsettled political machinations and unfavorable economic conditions within Germany’s many principalities and ducal territories. Among the economic problems were: 1) an oppressive and annoying compulsory service to the overlords, a remnant of medieval feudalism, 2) an increasing repeal of former grazing and wood gathering rights in ducal forests, and 3) mounting taxes which rested on the land owning classes alone. As a result, many sold their real-estate and emigrated. In addition to the enforced labor, there were gradually introduced grazing fees, hunting fees, watch fees, plowing fees, dyeing fees, food tax, tax on second hay crops, hand work rendered, money paid in lieu of labor with teams, the Prince’s personal tax, chimney tax, water tax, the so called “hearth tax”, etc. There were also the percentage of one’s Shrovetide fowls and Martinmas geese. For four years after the death of her husband, Johanna Seibert raised her children alone. In 1736 Johanna married Henry Lorentz, who brought a daughter to the family from a previous marriage. Within two years of their marriage, the family decided to emigrate to America. During the spring of 1738, several great-grandsons of Nickel Seibert, the miller, set out from Saarland for the Pennsylvania colony in North America. Among those emigrating were: Johanna Seibert-Lorentz, her children Wendel, age 23; Jacob, age 21; Catherine; and husband Henry Lorentz, and his daughter. Several Seibert cousins, including two grown males and their sisters were also in the party of emigrants. The 280 mile trip down the Rhine River took four to six weeks! Occasionally, the already poor emigrants arrived in Rotterdam having spent what little money they had. whole freight, six feet long and one and one- half feet wide. bread for the entire week. two quarts of water daily, to each whole freight. kinds of aromatics and also wine so that the sick can be better cared for. In Witness where of we have validated this Contract with our personal signature. It would be nice to think that our emigrant ancestors received the fair treatment promised in their contract, “But how often must have happened, that emigrants lost their entire baggage on the way, through treachery, theft or violence. Contemporary reports are filled with hair raising accounts of this. The crossing of the Atlantic – remember this was 1738 – took eight to twelve weeks. Tuesday, 9 September 1738: Four or five months after leaving Sotern, the Seibert-Lorentz group landed in Philadelphia, Pennsylvania and were authorized to enter the colony. Jacob, being under the age of consent was apparently not required to sign his name to the legal immigration document. A copy of the ships passenger manifest, showing the names of Johan Jacob Seibert and Henry Lowrence, accompanies this document. The earliest record of the Seibert family in Germany dates to the baptismal record of Nickel Seibert of 26 October 1569. It was about this time that surnames were widely adopted in Europe. When the Seibert’s landed in America, a clerk unaccustomed to Germanic spelling convention, changed the two century old SEIBERT – to SEYBERT. Jacob continued to use the old spelling in his signature; however, be aware that the new Seybert spelling became a custom, as seen in the name, Fort ‘Seybert’. 26 February 1739: A half year after landing in America and at age 22 years, Jacob Seybert married Mary Elizabeth Theiss. The services were performed by J. Casper Stoever. 28 March 1739: A month after their marriage, Jacob received a 209 acre tract of land in Bethel Township from the Penns. was a very beautiful and fertile country in the river valleys southward. This area was composed of three rivers which flowed north to form the Potomac, each separated from the other by a mountain range. Early 1748: Family members attending the Trinity Reformed Church in the Tulpehocken region were: Jacob Seybert and his wife Mary Theiss; Mary’s sister and brother-in-law, Christian Lauer; Johanna and husband, Henry Lorentz. Later 1748: Jacob and his family, his mother and stepfather and other relations left their farms in Tulpehocken region of Pennsylvania and traveled 180 miles southwest to the South Fork valley wilderness of Highland County, Virginia. In the mid 1700s, the area where they settled was on the leading edge of the Anglo-Saxon colonization of America. Jacob’s brother, Wendel remained in Pennsylvania. 1753: Meanwhile, living in South Fork Valley, Jacob and Mary increased their number of children with the births of: Elizabeth born in 1749; Henry, born 1751; and George, born 1753. Twenty seven tracts of land were surveyed on the wilderness plateau of South Fork Mountain, west of the Dyer settlement. Of the twenty one persons applying for land patents, sixteen were newcomers in Highland County, including Jacob Seybert. Small Shawnee hunting parties often visited the homes of the settlers. Through them and the traders, the Indians picked up serviceable knowledge of the white man’s tongue. That their English vocabulary was well supplied with terms of abuse and profanity, is significant of the sort of language they were accustomed to hear. Meanwhile, the European settlers cut the trees and cleared the ground thus scaring away the game. This in turn caused the Indians to give up land and fall back in pursuit of their food supply. White and Indian relations were further strained by the fact that the European’s, except for the French, did not go to any pains to win or keep the good will of the “Red men”. In the fall of 1753, the Shawnee of the South Fork of the Potomac were visited by neighboring Indians from across the Ohio River, who urged them to move out of their (West Virginia) country. Among those at the conference was Killbuck, chief of a small band of Shawnee, who lived and hunted the region where upon sat the cabins and farms of the Dyer Settlement. Killbuck was known, even amongst the “Whites,” as an Indian of “much ability and strong mental powers.” At the conclusion of the conference, the Shawnee accepted their red brothers’ offer to move west, and in the spring of 1754 they quietly and abruptly left. Before the beginning of hostilities, Killbuck had lived among the settlers and was acquainted with many of them. In particular, he held a grudge against Peter Casey. Casey had once employed Killbuck to bring back a runaway slave. When Killbuck delivered the slave, Casey refused to pay him the promised sum. In an altercation that followed, Casey knocked Killbuck down with his cane, an indignity not to be borne by the lowest Indian, much less by a proud chief. Killbuck controlled his anger at the time, but when war broke out he relentlessly sought to kill Casey; however, he never found the opportunity. Yet, according to the Indian custom, an injury or insult from one man might be avenged upon anyone of the community to which he belonged. Prior to the year 1754, various small tribes or clans, belonging to the general Shawnee nation, roamed over the Valley of Virginia and the valleys and mountains of Pendleton County. Although they established settlements and formed villages, their dwelling was largely transitory. They did not recognize individual or tribal ownership of the land. The whole area was a great hunting ground into which they came, where they stayed, and from which they left of their own will. The mountain region was rich with wildlife including ground hog, opossum, raccoon, squirrel, rabbit, bear, wild turkey, deer and panthers. In the earliest days of settlement there had even been a few elk and buffalo. 21 May 1755: Jacob Seybert purchased the 210 acre John Patterson Jr. farm and mill in the Dyer Settlement. (See: Pendleton County Map) The same day, his step brother-in-law, Nicholas Haffner, bought an adjoining farm. 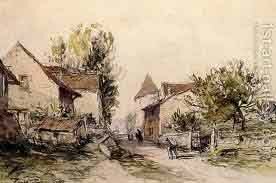 Jacob’s brother-in-law, Matthais Theiss, also settled in the area, as did Jacob’s mother and step father, Johanna and Henry Lorentz. Between 1755 and 1759, the frontiers of Pennsylvania, Maryland, and “west” Virginia were exposed to increased attack as the French and Indian War flared anew. Boarder settlements were harassed by raiding parties of Indians, who at times acted alone; while at other times were accompanied by French soldiers. The resulting damage was great and was done by a comparatively small number of warriors. military blockhouse. The log house of the frontier was built considering a possible attack. Commonly the structure was constructed near a spring. The door could be strongly barred and the windows were too small for a man to crawl through. There were loopholes in the walls through which the inmates could fire their guns. And if possible, it was not too near a spot where the enemy could find cover. A few of these old log houses still stand in this region of West Virginia and in some instances are still occupied; in the walls are “shooting-holes” which have since been covered by weather boarding. The Indians believed that by scalping their enemies they would be safe from harm from that enemy in the after life, since no one could enter the next world if disfigured in body or limb. Wives were killed so they would not bear any more children to grow up and avenge their slain husband. If a life was spared – as was often the case with the young – the captive was adopted. Otherwise, boys were killed because they would grow into warriors. Girls were killed because they would become mothers of more warriors. Finally, the house was burned in order to damage the enemy that much more. In 1755 the colonial governments decided to fight the Indians in the same way and began offering a bounty of 10 for the scalp of any hostile Indian over twelve years of age. 1755: Seventy one civilian settlers were either killed or taken captive by the Indians, resulting in a stream of refugees pouring through the Blue Ridge for safety. 1756: Virginia appropriated $33,000 to build 23 forts. George Washington was sent into the frontier where he set up headquarters at Winchester, in northernVirginia. February: Jacob Peterson, living on North Mill Creek near Grant Line, lost six children to capture by the Indians – only one later escaped. 16 May: Michael Freeze and his wife, who lived in an area called Upper Tract, were killed. Fort Upper Tract, in South Branch Valley, was built a mile above Harman’s Landing and a mile south of the present Upper Tract village. Built on a bluff, on the bank of the South Branch of the Potomac River, it was protected by a steep slope on one side, while being afforded some protection on two other sides by a ravine. The enclosed space was however very limited. The structure’s foundation can still easily be traced on the ground. The Dyer Settlement was located only nine miles southeast of Fort Upper Tract, just over South Fork Mountain. The fact that the previous owner, John Patterson Jr., had a mill at the river’s edge also influenced the choice of the site of Fort Seybert. A road of some description was always built to a mill. Consequently, the settlers could use the same road to get to the fort for safety. There was also a bridle trail, or road of similar description, that began at the Patterson-Seybert property and went over the Shenandoah Mountain to Captain John Smith’s place and on to the county seat at Augusta, Virginia. The fort was built about 100 yards from where the mill stood, and there was a good spring fifty to sixty yards from the fort. 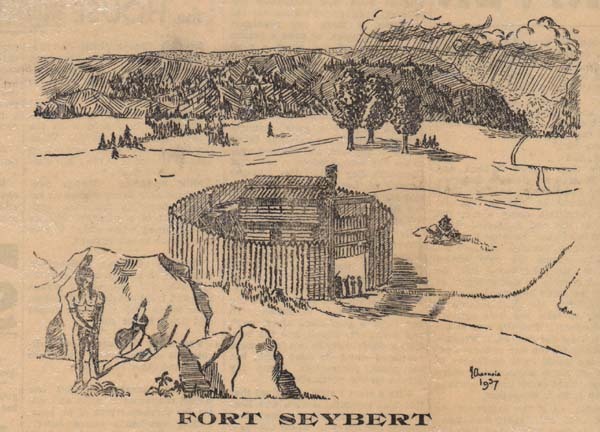 A description of Ft. Seybert: “There was a circular stockade with a two storied block house inside. The diameter of the stockade was about 90 feet. (See the drawing at the top of this article). FortSeybert stood in what became during the late 19th and early 20th Century the yard of the William C. Miller [alive in 1916] house. The Miller house is located about 0.5 miles north of the Fort Seybert Post Office, the Fort Seybert mail drop.) on the west side of County Road #3, also known as the Sweedlin Road, Fort Seybert, Pendleton County, West Virginia. When constructing his home, Mr. Miller preserved in its original location a foundation cornerstone under his cellar window and another cornerstone on the surface of his lawn, 21 feet away. Nor did he obliterate the circle arc that showed where the stockade wall use to rise. In a circa 1910 photograph of the Miller house and yard, the location of the former log wall can be seen as a slight depression in the ground. Winter 1756-57: During the winter season the settlers were quite safe. The Indians were not inclined to maraud while food was scarce and the forest leaves fallen. 16 March 1757: Possibly as a result of the tragedy at the Michael Freeze home ten months earlier, Jacob Seybert, age 40 years, was commissioned Captain of Militia. 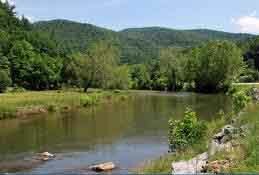 farther and farther down the South Fork and South Branch of the Potomac. 10 November: Determined to stay and fight the Indians if necessary, Jacob applied for a land patent for an additional 88 acres. By the end of 1757, there were only about forty families, or about two hundred European – Americans left spread out in small settlements inPendletonCounty. 19 March 1758: A destructive Indian raid occurred in the region of Fort Upper Tract. On this day three men were shot dead while working about their homesteads. Two other men were wounded, and two persons were captured by the Indians. Fort Upper Tract was located only nine miles northwest of Fort Seybert, just over SouthFork Mountain. frontier. Within days the scouts came upon the tracks of another large party pursuing the same course. 24 & 27 April: A band of French and Indians arrived in the valley near Fort Upper Tract and killed Captain James Dunlap and nine other persons. Captain Dunlap was an experienced soldier who had commanded a detachment in the Big Sandy Expedition. Three days later, the Indians attacked Fort Upper Tract and killed an additional thirteen defenders before burning the fort. It is thought that the massacre at Fort Upper Tract was complete since no stories have ever surfaced in local tradition. After massacring the soldiers and settlers at Fort Upper Tract, the large Indian war party began its trek back to Indian country. However, a group of forty or more Shawnee with perhaps one Frenchman, led by Chief Killbuck, took an independent course of action. They proceeded southeast over South Fork Mountain toward Fort Seybert. Meanwhile, the residents of Dyer Settlement, having learned that an attack was imminent, sent an express rider to Fort Upper Tract for assistance, but the rider turned back upon seeing the tell tale column of smoke from the burning buildings. Upon hearing of the nearby attack, several families from Dyer Settlement immediately left to cross the Shenandoah Mountains for safety. Forty people were left to gather at Fort Seybert, of which very few were men. Prof I. Daniel Rupp, A Collection Of Thirty Thousand Names of German, Swiss, Dutch, French and Other Immigrants in Pennsylvania from 1727 to 1776, (Baltimore: Genealogical Publishing Company, reprinted 1965), p. 116-117. Through various land divisions, parts of Highland County became Augusta County. In 1788, parts of Augusta, Rockingham and Hardy Counties were formed into Pendleton County, Virginia. In 1863 Pendleton County became part of the newly formed state ofWest Virginia. Mary Lee Keister Talbot, The Dyer Settlement -The Fort Seybert Massacre-Fort Seybert, West Virginia, (The Roger Dyer Family Association, 1937) . The house was still standing in 1988, but was uninhabited. The two corner stones are still evident in the locations discussed. The William C. Miller property is [in 1988] owned by Paul Conrad, the husband of a Miller descendant, who lives in the next house on this property (see footnote 34). Fort Duquesne, French, built 1754, and taken by the British in 1758 then renamed Fort Pitt; now the site of Pittsburgh, Pennsylvania.